Canonical Ubuntu announced Ubuntu for Phone. Yes they completely built new OS around Android kernel & drivers but not using JVM (Java Virtual Machine). Ubuntu for Phone has a beautiful interface and full PC capability when docked. It means Ubuntu for the phone will work like any other mobile OS like Android but when you docked with a monitor, keyboard or mouse it’ll turn into Desktop OS. You can get full PC experience on phones when docked. 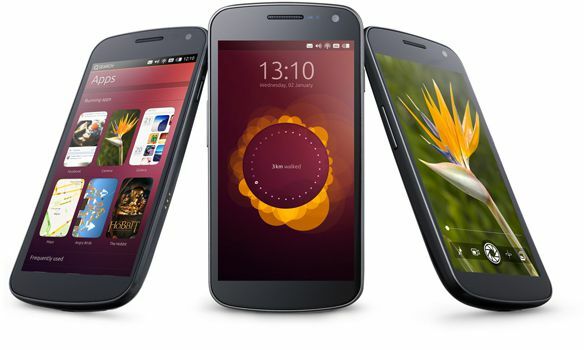 Ubuntu aimed at two core mobile segments: the high-end superphone, and the entry-level basic Smartphone. Ubuntu for phone supports both HTML5 & native apps. Ubuntu ease the OEM work with easier hardware enablement. Ubuntu has already been adapted to run on chipsets using the ARM and Intel x86 architectures relevant for mobile devices, with the core system based around a typical Android Board Support Package (BSP). So chipset vendors and hardware manufacturers do not need to invest in or maintain new hardware support packages for Ubuntu on smartphones. Ubuntu uses simple natural swiping gestures from the edges of the screen to make it easier than ever to access your content and switch between apps. You can swipe from the right side brings the app you last used. A full left-to-right swipe reveals a screen showing all open apps. The controls of the app are hidden so that you can focus on the contents. Swiping up from the bottom edge of the phone reveals app controls. Search for person, email, contacts alongside Facebook friends & twitter followers, music, books etc. Ubuntu doesn’t just search music on your phone but it also searches online retailers including Amazon & Ubuntu One Music store. Ubuntu reflects all the notifications on the lock screen. Ubuntu reinvents the Inbox. You can access emails, texts, call & social media posts from single Message app. You can instantly reply any message by swiping down from the top. All the shot you captures will automatically upload to Ubuntu One personal cloud account. The Gallery makes it easier to organize, find and share photos.